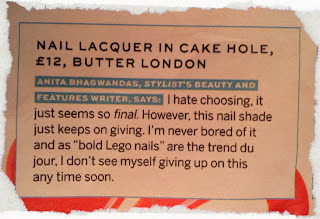 Whilst reading this weeks Stylist mag I spotted a little snippit which gave me an idea, oh yes... Lego nails! Now this isn't something I would normally wear on my nails, and I have to admit I wasn't even brave enough to leave the house with it on. However, once that little idea popped into my head I just had to give it a go. I picked out my best lego colours - Spring Green, Matt White, Cyan Blue and Bright Red from Barry M and Electric Yellow from Maybelline (I bought the green and yellow at Superdrug this week and got a free limited edition Barry M, bonus!). 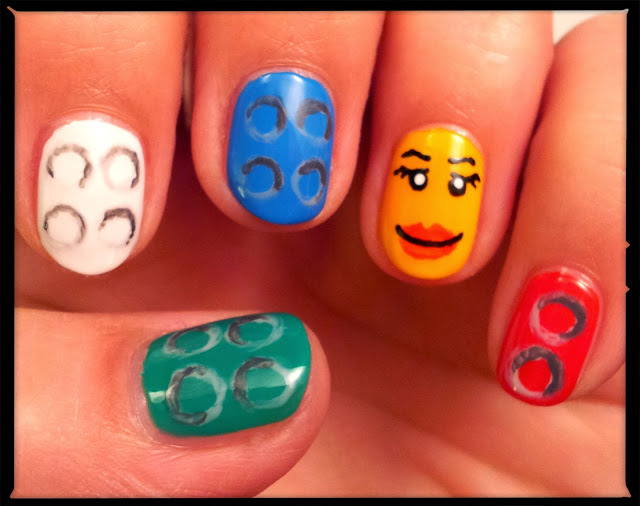 For the brick nails I painted on small circles in light grey and then added showing with a darker grey. They're not as neat as the could be but I couldn't find a brush small enough to get them perfect. 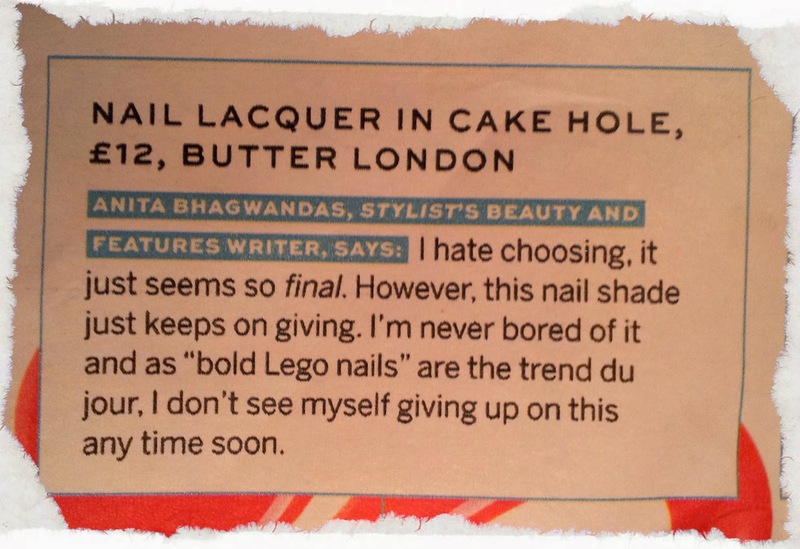 To mix it up a bit I decided to add a Lego head on the yellow nail, and obvs it had to be a glamorous lady head! 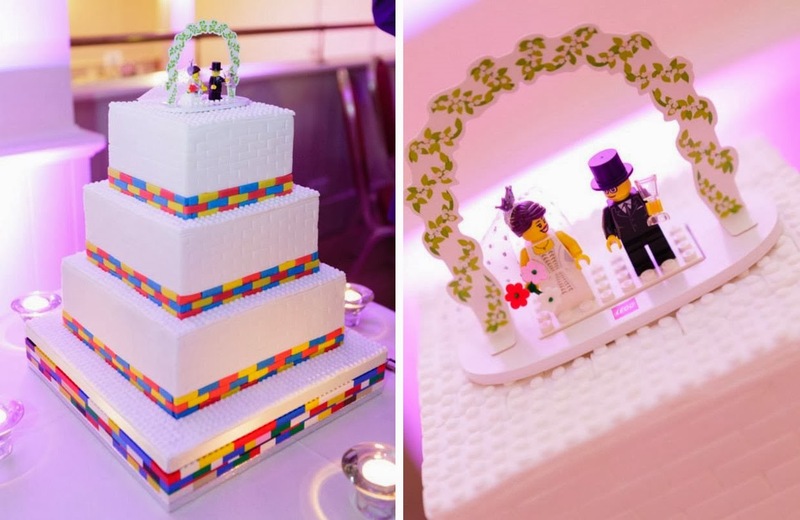 I think I'll stick to Stylist's advice and just take colour inspo from Lego in the future. I love bold bright colours and can't wait to try the Electric Yellow in a full mani (just without the Lego face next time) especially as it's the 'trend du jour'!